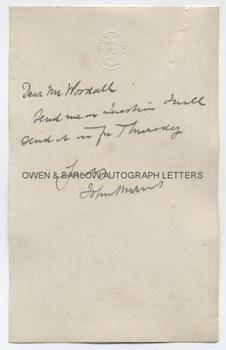 JOHN BURNS Autograph Letter Signed. British (English) Trade Unionist and militant Socialist. Leader of the London Dock Strike of 1889. ALS. 1p. The House of Commons. No date. To [William] Woodall. 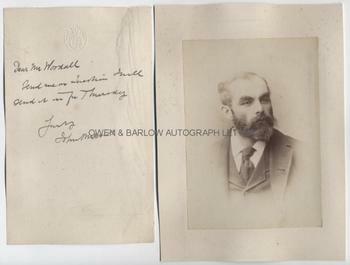 Together with a fine, early albumen portrait photograph of John Burns. "Send me a question. I will send it in for Thursday". 8vo. Approx 7 x 4.5 inches. 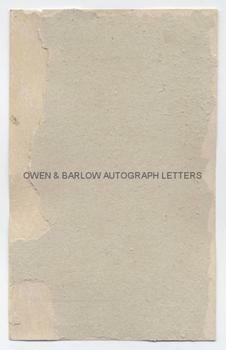 Creasing to right edge and mounting damage to blank verso. Else good or very good. 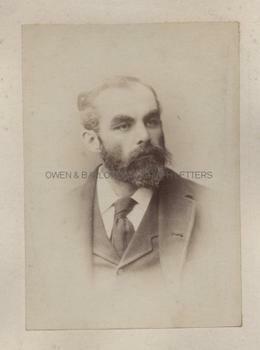 The portrait of John Burns is a rare early (circa 1892) image, being an albumen silver print photograph, showing him head and shoulders in vignette. It measures approx 5.75 x 4 inches (excluding mount) and is laid down on a card mount from an album leaf. There is mounting damage to verso but the photograph is in fine condition. John Burns was born in Vauxhall, the son of a Scottish fitter. He became an apprenticed engineer and educated himself at night school. Influenced by the writing of Robert Owen and others, he became committed to Socialism and began outdoor speaking in favour of Socialist ideals and organised labour, for which he was arrested and imprisoned on several occasions. He took part in the West End Riots (1886) and the 'Bloody Sunday' demonstrations (1887) for which he was charged with sedition and imprisoned for 6 weeks. In 1889 he played a key part in the historic London dock strike, when he became known as "the man with the red flag". He joined the independent Labour Party and in 1892 he was elected as one of its first M.P.s as the Member for Battersea, a seat which he held until 1918. He allied himself with the Liberal Party and, in 1905, he was appointed President of the Board of Trade by Henry Campbell-Bannerman - becoming only the second working man to hold a Cabinet post. Both the letter and the photograph are from a 19th century collection made by the radical Liberal M.P., William Woodall. Woodall shared many of the views of John Burns and from 1884 had been leader of the group in Parliament who supported women's suffrage and he was also a supporter of organised labour, technical education, home rule for Ireland and other radical causes.